Mahabharata, the great Indian epic is a story of vows and commitments, a story where oaths and promises were the foremost for everyone, be it Kaurava or Pandava and the protagonists would go to any extent in order to keep their words. One such vow became a reason for Arjuna to kill his beloved elder brother Yudhisthira. It was the seventeenth day of the Kurukshetra war. 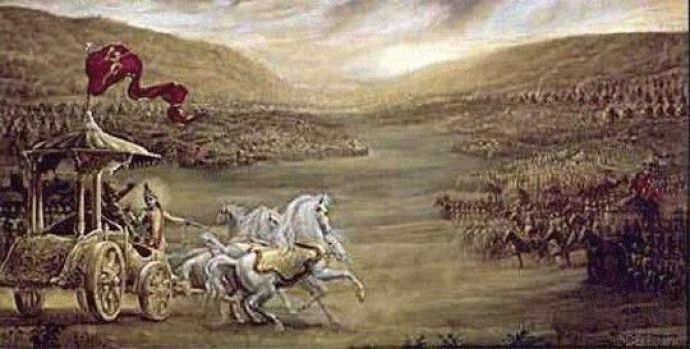 Although most of the Maharathis of the Kaurava army had fallen, including Bhishma and Drona on tenth and fifteenth day respectively, Karna was still fighting with all his might. After the death of guru Dronacharya, Karna was named the Senapati of the Kaurava army and had been unstoppable. When Karna and Yudhisthira entered in a duel, Karna defeated Yudhisthira and severely wounded him. However, Karna didn’t kill him, because he had sworn an oath to his mother Kunti that he will not kill any of her sons. That time, Duryodhan had suggested Karna to capture Yudhisthira and put him in prison. Seeing Yudhisthira badly wounded, the twin brothers Nakula and Sahadeva took him away from the battlefield. In order to capture Yudhisthira, Duryodhan and other warriors ran after him, but Nakula and Sahadeva stopped them in between by attacking them. Yudhishthir was ashamed after losing to Karna. The other two brothers Bhima and Arjuna were still fighting on the battlefield. When Arjuna came to know about Yudhishthira, after being done fighting with samsaptakas, he approached Bhima. Arjuna wanted Bhima to look after Yudhisthira, but Bhima declined as it was against his principles to leave a battlefield in between a fight. Bhima then instructed Arjuna to be with Yudhisthira and assured him that he alone would take care of the samsaptakas. When an injured Yudhishthira saw Arjuna and Lord Krishna both entering his tent, he presumed that Karna has been killed, he thought that Arjuna has defeated Karna and has avenged him. So he mistakenly assumed that Arjuna has approached into the camp only to deliver the news. Arjuna, however, responded to his elder brother that he had not killed him yet and confirmed that the actual reason of his presence in the camp is only ‘out of concern’. After hearing this, Yudhishthira's disappointment began crushing. His anger and frustration boiled over, and he railed against Arjuna. He started insulting Arjuna by calling him “worthless” and accused him of being fearful of Karna. He said that he would ask Bhima or Lord Krishna to kill Karna. 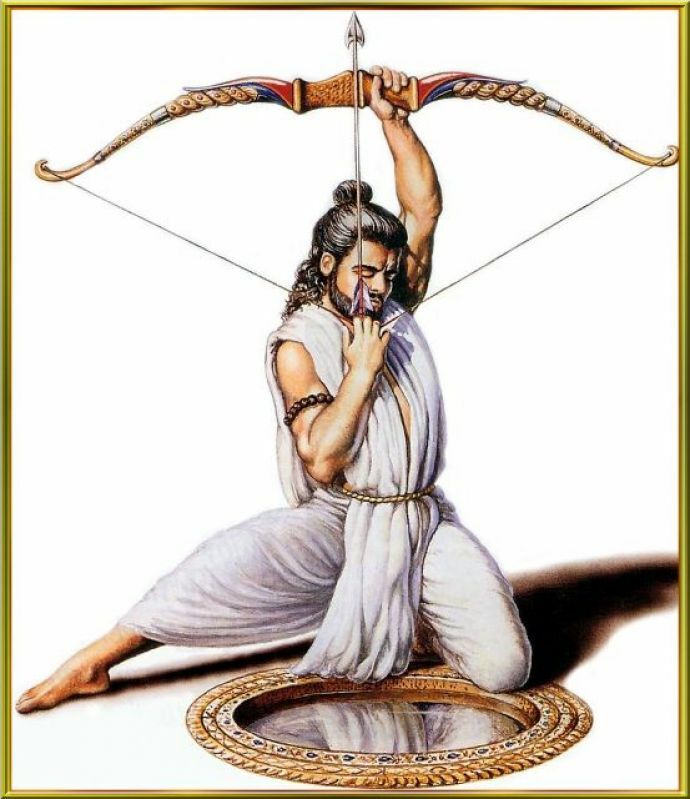 At one point, he even yelled at Arjuna by telling him to give up his Gandiva, the bow of Arjuna that was created by Lord Brahma to protect Dharma. Gandiva’s insult made Arjuna extremely furious. He drew his sword and rushed towards Yudhishthira to slay him. Lord Krishna stopped him and asked him the reason for drawing the sword. Arjuna replied that he had a secret vow that anyone who insults his bow shall be slain by him. Since vow should never be broken he insists that he will have to kill his own brother even if he doesn’t wish to. 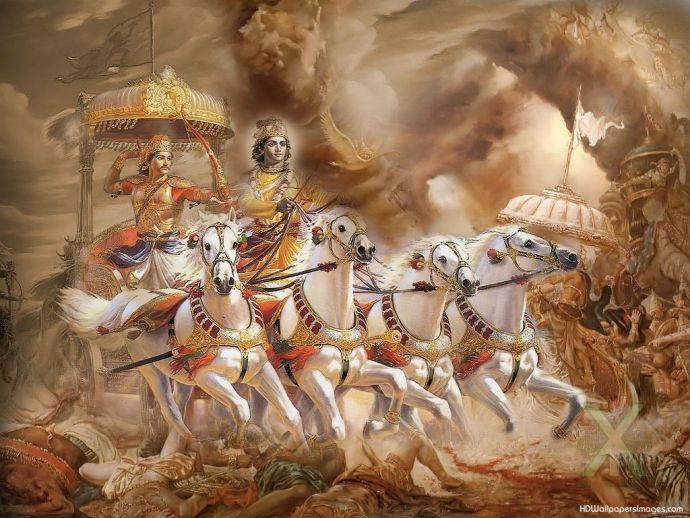 Lord Krishna tells Arjuna that he is making a mistake and reminds him of his bigger Dharma – winning the war. He advises Arjuna that the right, and only, way to ‘kill’ an elder was to use harsh words and insult the elder. He instructs Arjuna to do the same against Yudhishthira. So, Arjuna starts insulting his brother in order to keep his vow intact. In his outburst, Arjuna keeps telling Yudhisthira how only Bhima has the right to snub him (Arjuna) and not Yudhisthira. He even called Yudhisthira incapable and also accused him as the source of all their problems. However, after a while, Arjuna felt bad that he insulted his brother. After completing his outburst, he draws his sword out once again, this time only to behead himself. A seemingly surprised Krishna stops him and asks him the reason for this repeated act. To which Arjuna responds that he can no longer live after having abused his beloved brother in this manner. 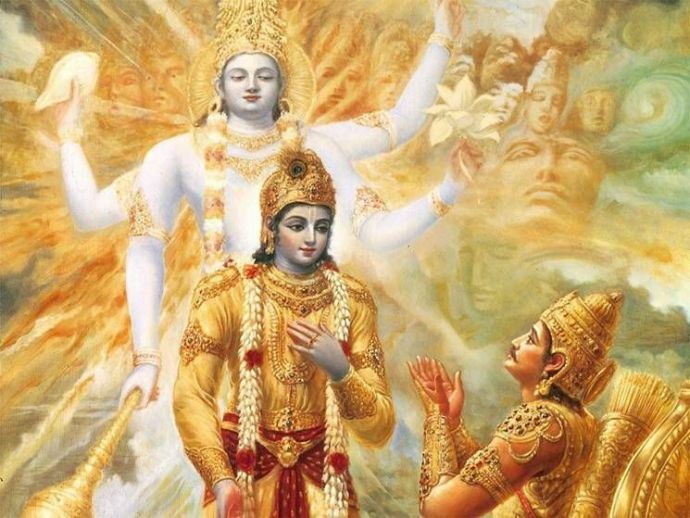 Lord Krishna again counsels Arjuna by saying that suicide is not appropriate for any human being as the body is the ‘Kshetra’ where the ‘Sadhana’ of the soul can take place. Dharma, Artha, Kama and Moksha can be achieved only by utilising the body and therefore self-destruction of one’s body is strictly prohibited. Krishna came out with another solution and mentioned a way out of it. As per dharma, self-praising and boasting in public is a sin which is also equivalent to one’s own death. 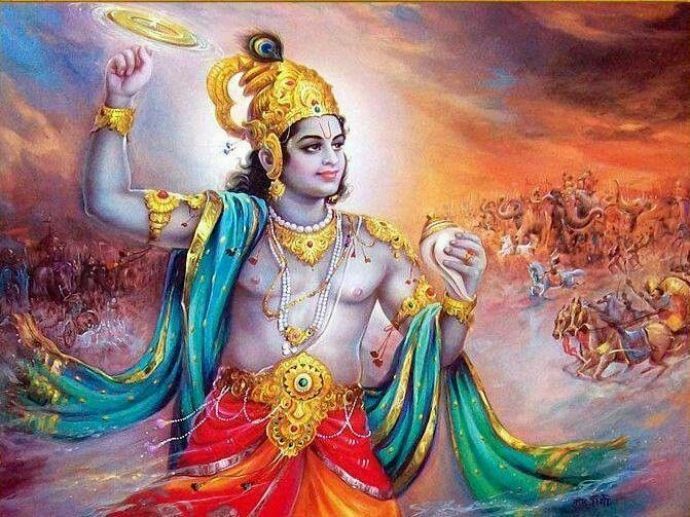 So, Lord Krishna instructs Arjuna to praise himself heartily. Arjuna follows Krishna’s advice and indulges in heavy self-praise for a while. Thus, fulfilling his desire to commit suicide. This is how Arjuna killed Yudhisthira as mentioned in Karna Parva of Mahabharata.